Are You Recruiting the Right Person in the Right Ministry? Like the cry sounded forth in recent years in the world due to food, fuel, and financial shortages, so do churches sound the alarm due to labor shortages. Many churches are failing to reach peak quality and effectiveness because they lack capable lay leadership and ministry workers. Before pointing the finger at the busy, cluttered lives of so many Christians, perhaps church leaders should first examine the effectiveness of their staffing ministry. 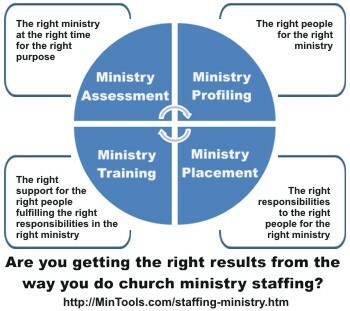 Effective staffing ministry must line up with God's design and purpose for the church. Is it merely about filling positions? Or, is your church staffing ministry about getting the right person for the right ministry so you can most effectively accomplish God's work His way? Assessment: In light of your church purposes, what ministry should be happening? Ministry Profiling: Who are the workers needed to accomplish the ministry? Take into consideration spiritual gifting, heart passions, personality temperament, experience, and walk with God. Recruitment: How will you contact the people whose ministry profile fits the task to see if they are available and willing to serve? Placement: How will you go about placing the right person into the right ministry at the right time? Training: What resources and encouragement will you provide prospective and current workers to help them be effective? Interested in a Print Version? The Staffing Ministry Manual briefly expounds on some of the content on this page and also provides a three page assessment to evaluate your staffing ministry practices in light of the above.